Inform guests their room was cleaned by someone that truly cares. 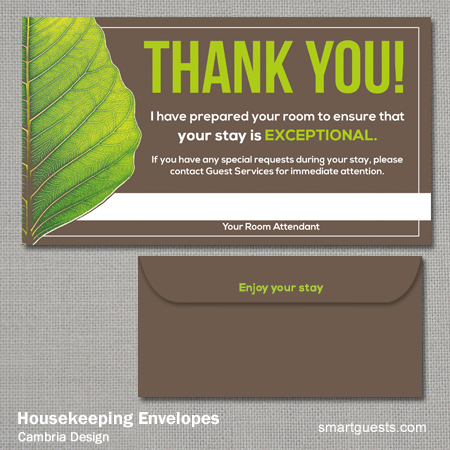 These envelopes create a human touch that build confidence in your housekeeping team. Perfect for Hotels, Hospitals, Nursing Facilites, Home Cleaning Companies, Apartments and other cleaning services. Customization also available. Contact Us. "I have prepared your room to ensure that your stay is EXCEPTIONAL. If you have any special requests during your stay, please contact Guest Services for immediate attention." Our Florida-based experts can help.